^ a b c Houeix, Romain (26 February 2018). "Irish reunification 'on the table, says Sinn Fein's new leader amid Brexit talks". France 24. Retrieved 29 March 2018. ^ "Sinn Féin: definition of Sinn Féin in Oxford dictionary (British & World English). Meaning, pronunciation and origin of the word". Oxford Language Dictionaries. Oxford University Press. 2013. Retrieved 1 December 2013. ^ Niall Ó Dónaill (1977). (advisory ed. Tomás de Bhaldraithe) (ed.). Foclóir Gaeilge-Béarla [Irish-English Dictionary] (in Irish). Dublin: An Gúm. pp. 533, 1095. ISBN 978-1-85791-037-7. ^ "The first Sinn Fein party". Multitext.ucc.ie. Archived from the original on 13 May 2010. Retrieved 20 April 2010. ^ "Shinners are like the Fianna Fáil of old". Irish Examiner. ^ "The Shinners have been housecleaning again". The Telegraph. ^ "BBC – History – 1916 Easter Rising – Profiles – Sinn Féin". Retrieved 25 July 2015. ^ Michael Gallagher, Political Parties in the Republic of Ireland, p. 41. Books.google.ie. 1985. ISBN 9780719017971. Retrieved 20 April 2010. 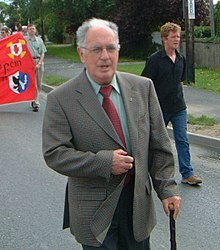 ^ "Ruairi O Bradaigh: IRA leader who believed fervently in armed struggle". The Independent. 6 June 2013. ^ a b Murray, Gerard; Tonge, Jonathan (2005). Sinn Féin and the SDLP: From Alienation to Participation. Dublin: The O'Brien Press. p. 153. ISBN 978-0-86278-918-3. ^ Murray and Tonge (2005), p. 155. ^ Feeney (2002), p. 326. ^ Feeney (2002), p. 328. ^ Feeney (2002), p. 331. ^ Feeney (2002), p. 333. ^ Murray and Tonge (2005), pp. 193–4. ^ "Sinn Féin man admits he was agent". BBC. 16 December 2005. Retrieved 29 March 2007. ^ "Donaldson murder scene examined". BBC. 6 April 2006. Retrieved 29 March 2007. ^ "Real IRA claims responsibility for 2006 murder of Denis Donaldson". irishtimes.com. 4 April 2009. Retrieved 17 December 2011. ^ Angelique Chrisafis (25 November 2004). "Paisley hints at movement on IRA". London: The Guardian. Retrieved 28 March 2007. ^ "Sinn Féin rejects 'shadow' Assembly". RTÉ. 2 September 2006. Retrieved 28 March 2007. ^ "Sinn Féin ends policing boycott". BreakingNews.ie. 28 January 2007. Retrieved 28 March 2007. ^ "Sinn Féin 'must show visible support for policing'". BreakingNews.ie. 28 January 2007. Retrieved 28 March 2007. ^ "Former IRA prisoner to stand against SF". BreakingNews.ie. 29 January 2007. Retrieved 28 March 2007. ^ Aidan Lonergan (9 June 2017). "Gerry Adams confirms Sinn Féin will not swear allegiance to the Queen to take Westminster seats". Irish Post. Retrieved 9 June 2017. ^ Bardon, Sarah. "Sinn Féin loses 13 public representatives over bullying claims". Irish Times. Irish Times Trust. Retrieved 6 February 2018. ^ a b McDonald succeeds Adams as President of Sinn Féin. RTE. Published 10 February 2018. Retrieved 11 February 2018. ^ Mary Lou McDonald succeeds Gerry Adams as Sinn Féin leader. The Guardian. Published 10 February 2018. Retrieved 11 February 2018. ^ Mary Lou sets out her SF agenda: ‘Opportunities for all, not just the few’. The Irish Times. Published 10 February 2018. Retrieved 11 February 2018. ^ Fenton, Siobhan (24 June 2016). "Northern Ireland's Deputy First Minister calls for poll on united Ireland after Brexit". The Independent. Retrieved 14 December 2016. ^ "Irish government allegations about IRA army council". London: Independent.co.uk. 21 February 2005. Retrieved 20 April 2010. ^ "Gerry Adams and Sinn Fein". PBS.org. Public Broadcasting Service. 1998. Archived from the original on 9 July 2000. Retrieved 30 May 2015. The relationship between Sinn Fein and the IRA, historically, has been symbiotic. It is impossible to separate them. In more recent years, Sinn Fein has said, "We are not the IRA, they are a totally separate organization." In the minds of the vast majority of people in Ireland, whether they are Unionist or Nationalist, Sinn Fein is the political wing of the IRA, and it has played that role quite hotly down the years. ^ "People's Daily Online – Sinn Fein says IRA may cease to exist". Retrieved 25 July 2015. ^ "- Irish Examiner". Retrieved 25 July 2015. ^ "Sinn Fein Leader Snubbed by Bush, Kennedy". Retrieved 25 July 2015. ^ Brendan O'Brien, the Long War, the IRA and Sinn Féin (1995) ISBN 978-0-86278-359-4, p. 128. ^ "Press Briefing: 3.45pm Monday 21 February 2005". 10 Downing Street online. 21 February 2005. Archived from the original on 26 May 2008. Retrieved 30 May 2015. ^ Owen Bowcott (7 January 2005). "7 January 2007". London: Guardian. Retrieved 20 April 2010. ^ Lee Glendinning (9 October 2008). "9 October 2008". London: Guardian. Retrieved 20 April 2010. ^ "Resignation call rejected". BBC. 19 January 2005. Retrieved 28 March 2007. ^ Katie Mingey (24 January 2005). "Fallout from bank raid". Irish Emigrant. Archived from the original on 2 December 2005. Retrieved 28 March 2007. ^ "Fourth report of the Independent Monitoring Commission" (PDF). Independent Monitoring Commission. 10 February 2005. Archived from the original (PDF) on 14 June 2007. Retrieved 28 March 2007. ^ Conor Murphy (27 February 2006). "IMC should be scrapped". Sinn Féin. Archived from the original on 27 September 2007. Retrieved 28 March 2007. ^ "Sinn Féin facing raid sanctions". BBC. 22 February 2005. Retrieved 28 March 2007. ^ "Adams challenges Ahern to have him arrested". RTÉ News. 10 February 2005. Retrieved 27 April 2006. ^ Tom Brady & Senan Molony (21 February 2005). "McDowell: These men are leaders of the IRA". Irish Independent. Retrieved 28 March 2007. ^ Peter Taggart (21 February 2005). "Dublin: Sinn Féin chiefs in IRA". CNN. Retrieved 28 March 2007. ^ Sharrock, David (28 February 2005). "Give up killers, people's protest tells IRA". London: The Times. Retrieved 28 March 2007. ^ Angelique Chrisafis (28 February 2005). "How pub brawl turned into republican crisis". London: The Guardian. Retrieved 29 March 2007. ^ Angelique Chrisafis (26 February 2005). "IRA expels three over McCartney murder". London: The Guardian. Retrieved 29 March 2007. ^ "IRA expels three after killing". BBC. 26 February 2005. Retrieved 29 March 2007. ^ "Two remanded in McCartney killing". BBC. 4 June 2005. Retrieved 29 March 2007. ^ "Sinn Féin must prove it supports the rule of law". Belfast Telegraph. 9 January 2007. Archived from the original on 28 January 2007. Retrieved 28 March 2007. ^ Garry Kelly (14 March 2005). "Senator Kennedy snubs Adams as US recoils at IRA crime". London: The Independent. Archived from the original on 11 July 2012. Retrieved 28 March 2007. ^ "SF stripped of Commons allowances". BreakingNews.ie. 10 March 2005. Archived from the original on 29 September 2012. Retrieved 30 May 2015. ^ "Sinn Féin chief says IRA may cease to exist". MSNBC. 12 March 2005. Retrieved 27 April 2006. ^ "Assessment on paramilitary groups in Northern Ireland". ^ "Sinn Féin on the Assembly debate on Abortion". Sinn Féin. 22 October 2007. Archived from the original on 25 October 2007. Retrieved 14 November 2007. ^ McDonald, Henry (7 March 2015). "Sinn Féin drops opposition to abortion at Derry congress". The Guardian. Archived from the original on 1 April 2015. Retrieved 30 May 2015. The party voted this weekend to support terminations in limited cases, such as pregnant women with fatal foetal abnormalities. ^ "Sinn Féin wants to Repeal the Eighth but avoids saying 'abortion' – Independent.ie". Independent.ie. Retrieved 25 May 2018. ^ Charalambous, Giorgos; Lamprianou, Iasonas (2016). "Societal Responses to the Post-2008 Economic Crisis among South European and Irish Radical Left Parties: Continuity or Change and Why?". Government and Opposition. Cambridge University Press. 51 (2): 269. doi:10.1017/gov.2014.35. "It has been rightly categorized by the relevant literature as populist socialist"
^ Suiter, Jane (2017). "Ireland: The rise of Populism on the Left and Among Independents". In Toril Aalberg; Frank Esser; Carsten Reinemann; Jesper Strömbäck; Claes H. de Vreese (eds.). Populist Political Communication in Europe. New York and London: Routledge. p. 131. ISBN 978-1-138-65480-8. ^ "Groups in the European Parliament". BBC News. 31 May 2011. Retrieved 14 May 2014. ^ "If You Believe in a Prosperous And Independent Ireland ... Vote No". Irish Election Literature. Retrieved 29 January 2016. ^ Nicholas Whyte. "The Referendums of 1973 and 1975". Ark.ac.uk. Retrieved 9 April 2018. ^ Michael Holmes (29 November 2005). Ireland and the European Union: Nice, Enlargement and the Future of Europe. Manchester University Press. p. 163. ISBN 978-0-7190-7173-7. ^ O'Doherty, Caroline (26 May 2008). "Sinn Féin urges treaty no vote in newsletter blitz". Irish Examiner. Retrieved 29 January 2016. ^ Moriarty, Gerry (20 April 2015). "SF says North should be able stay in EU in a Brexit". Irish Times. Retrieved 29 January 2016. ^ Kevin Bean (15 February 2008). The New Politics of Sinn Fein. Oxford University Press. p. 171. ISBN 978-1-78138-780-1. ^ Euroscepticism: Party Politics, National Identity and European Integration. European studies. Page 186. Chapter author – Karin Gilland. Edited by Robert Harmsen and Menno Spiering. Published in Amsterdam in 2004 by Rodopi. Retrieved via Google Books. ^ "Sinn Féin lobbies for Northern Ireland MPs to sit in Dáil Éireann". BBC News. 21 March 2002. Retrieved 20 April 2010. ^ "Belfast Telegraph, 16 April 2008". Belfasttelegraph.co.uk. Archived from the original on 23 July 2012. Retrieved 20 April 2010. 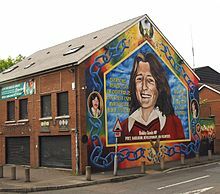 ^ Cumann, Martin Hurson. "174". Sinn Féin. Archived from the original on 15 December 2013. Retrieved 30 May 2015. This Ard Fheis reaffirms its support of equality in all of its forms and reaffirms its support for the LGBT community and commends the work of local councillors and party members throughout both the 26- and Six-County states for pushing for the extension of full marriage rights to the LGBT Community and An Phoblacht for its continued coverage of these important issues. ^ "The Road to Recovery: Sinn Féin Pre-Budget 2010 Submission" (PDF). Sinn Féin. 2009. Archived (PDF) from the original on 20 March 2012. Retrieved 30 May 2015. ^ Donnellan, Eithne (15 February 2011). "SF plans free GP and hospital care". The Irish Times. Retrieved 14 July 2011. ^ "Sinn Féin website, International Department". Sinnfein.ie. Archived from the original on 10 April 2010. Retrieved 20 April 2010. ^ "Sinn Féin and Fianna Fáil want to call TDs back from their holidays to talk about Gaza". thejournal.ie. 25 July 2014. Retrieved 20 August 2014. ^ Hennessy, Michelle. "Sinn Féin calls on Irish government to recognise Catalan independence". TheJournal.ie. Retrieved 16 January 2019. ^ Arthur Beesley (16 July 2003). "Sinn Fein to ask voters to reject EU 'superstate' constitution". Irishtimes.com. Retrieved 9 April 2018. ^ "SF opposes creation of EU 'superstate'". Irishtimes.com. 1 June 2004. Retrieved 9 April 2018. ^ "EU must change direction or risk disintegration". Matt Carthy. 27 April 2017. Retrieved 9 April 2018. ^ Staff writer (20 March 2017). "Sinn Fein to spell out Brexit opposition to Theresa May". Belfast Telegraph. Retrieved 30 August 2018. ^ "New Sinn Féin Ard Comhairle elected at Ard Fheis 2016". www.sinnfein.ie. Retrieved 4 June 2017. ^ Dr Nicholas Whyte. "Westminster election 1983". Ark.ac.uk. Retrieved 20 April 2010. ^ "Local Government Elections 1981". Ark.ac.uk. Retrieved 20 April 2010. ^ a b "Local Government Elections 1985". Ark.ac.uk. Retrieved 20 April 2010. ^ Dr Nicholas Whyte. "Westminster by-elections 1986". Ark.ac.uk. Retrieved 20 April 2010. ^ Dr Nicholas Whyte. "Westminster election 1987". Ark.ac.uk. Retrieved 20 April 2010. ^ "Local Government Elections 1989". Ark.ac.uk. Retrieved 20 April 2010. ^ Dr Nicholas Whyte. "Westminster election 1992". Ark.ac.uk. Retrieved 20 April 2010. ^ Dr Nicholas Whyte. "The 2001 Westminster elections in Northern Ireland". Ark.ac.uk. Retrieved 1 January 2011. ^ "Swearing in and the parliamentary oath". parliament.uk. Retrieved 14 May 2013. ^ "Sinn Féin press release". Sinn Féin. 18 December 2001. Retrieved 16 August 2008. ^ a b Political Party Seats Change Democratic Unionist Party. "Northern Ireland General election results 2010". BBC News. Retrieved 1 January 2011. ^ Dr Nicholas Whyte. "The 2010 Westminster elections in Northern Ireland". Ark.ac.uk. Retrieved 1 January 2011. ^ "Unionist 'unity' candidate agreed". BBC News. 9 April 2010. Retrieved 1 January 2011. ^ "Sinn Fein's Michelle Gildernew retains Fermanagh after dramatic recounts". Belfasttelegraph.co.uk. 7 May 2010. Archived from the original on 20 July 2012. Retrieved 1 January 2011. ^ Moriarty, Gerry (7 May 2016). "Assembly elections: DUP and Sinn Féin remain dominant". Irish Times. Retrieved 4 March 2017. ^ Gray, Dean (4 March 2017). "Sinn Féin closes gap on unionist rivals as middle ground collapses". Irish Independent. Retrieved 4 March 2017. ^ "Efforts to form a power-sharing administration to begin early next week". RTÉ. 4 March 2017. Retrieved 4 March 2017. ^ "Sinn Fein 29 April 2007 accessed 27 July 2009". Sinnfein.ie. 29 April 2007. Retrieved 20 April 2010. ^ "AnPhoblacht 29 March 2007". Anphoblacht.com. Retrieved 20 April 2010. ^ Peterkin, Tom (21 May 2007). "Daily Telegraph 21 May 2007". London: Telegraph.co.uk. Retrieved 20 April 2010. ^ Henry McDonald (27 May 2007). "27 May 2007". London: Guardian. Retrieved 20 April 2010. ^ "Results 2007". Irish Times. 28 May 2007. ^ "Sinn Fein wins by landslide in Donegal South-West by-election". Belfasttelegraph.co.uk. 27 November 2010. Archived from the original on 19 July 2012. Retrieved 1 January 2011. ^ "SF forms Dail Technical Group". The Irish Times. 10 December 2010. ^ "Pearse Doherty elected in Donegal South–West". RTÉ News. 26 November 2010. ^ Gallagher, Michael; Marsh, Michael. How Ireland Voted 2011: The Full Story of Ireland's Earthquake Election. Springer. pp. 149, 250. ISBN 0230354009. Retrieved 4 March 2017. ^ Gallagher, Michael; Marsh, Michael (2016). How Ireland Voted 2016: The Election that Nobody Won. Springer. p. 135. ISBN 3319408895. Retrieved 4 March 2017. ^ Christopher Took and Seán Donnelly. "2004 Local Election: Seats per Party per Council". ElectionsIreland.org. Retrieved 10 November 2009. ^ "Elections 2009: How Ireland Voted". Irish Times. 9 June 2009. ^ "The 2004 European Election". Retrieved 25 July 2015. ^ "Sinn Fein tops poll in Euro count". BBC News. 8 June 2009. Retrieved 20 April 2010. ^ "History made – Sinn Féin is now the largest party in the Six Counties". Sinnfein.ie. Archived from the original on 13 January 2010. Retrieved 20 April 2010. ^ "European Election: June 2004 – Dublin". Electionsireland.org. Retrieved 1 January 2011. ^ a b "2009 Euro – South First Preference Votes". ElectionsIreland.org. Retrieved 14 July 2011. Mícheál MacDonncha, ed. (2005). Sinn Féin: A Century of Struggle (in Irish and English). Dublin: Sinn Féin. ISBN 978-0-9542946-2-5.